Pretty in pink GHD gift set - order the pink GHD gift set. GHD is the name in hair straightening. We bring you the full range of best selling hair straighteners at the lowest prices along with next day delivery. We only recommend genuine stockists for cheap ghd hair straighteners. GHD or good hair day changed the world of hair dressing. With GHD straighteners you can create salon results at home. Available in three sizes. The GHD IV styler for medium length hair, the GHD Mini styler for shorter hair styles and the GHD Wide Salon Styler for very long or thick hair. The pink GHD IV styler is released to promote breast cancer awareness. Now there are two new limited edition GHD straighteners, the gloss black GHD Dark and the all white GHD Pure. To obtain your two year extended manufacturers guarantee you should only purchase your new GHD straighteners from a GHD approved stockist. 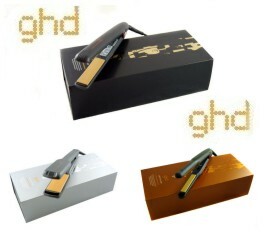 Register your new hair straighteners on-line at ghdhair.com. Another new GHD straightener and this time its purple. The new purple GHD comes with a lovely purple paisley bag which matches the design on the straightener. A GHD purple travel dryer and sectioning clips complete the package. GHD continues it's long line of limited edition hair straighteners with the Midnight Colledction, the Boho Chic and now the GHD Pink Orchid straighteners. Use Thermodynamics to cleanse and nourish. Protect your hair from heat damage with GHD products. The Thermodynamic range has products to hold your new style. Let the beauty of your hair shine through with Thermodynamic finishing products. These are the cheapest GHD hair straighteners from an official approved supplier. The latest version of the standard size GHD straightener at just £83.95. The narrow version of the GHD IV straightener for shorter hair at just £89.00. The GHD wide hair straightener for longer, thicker hair at just £97.00. The lastest limited edition pink straightener is out now but don't delay, they won't be around for long. The original purple GHD has been replaced by the GHD colour collection. Order the new purple GHD from the colour collection now. Limited edition GHD Dark IV styler, high gloss black finish. Limited edition GHD Pure IV styler, high gloss all white straightener.